LAKEVILLE-MIDDLEBORO, Mass.--(BUSINESS WIRE)--The countdown is on to one of the most delicious days of the year. But if you’re looking for recipes so you can gobble without the post-holiday wobble, look no further than the healthy and delicious cranberry. This year, Ocean Spray is serving up five ways to turn tasty holiday staples like stuffing and cranberry sauce into a better-for-you banquet! One fruit, five delicious ways! Make more out of holiday meals with a deliciously healthy play on a festive little fruit – the cranberry that is! These dishes will leave guests feeling satisfied, not stuffed. 5-0 Cosmo – Serve-up all the flavor but none of the guilt with reduced calorie cocktails like our 50 calorie Cosmo. Ocean Spray® Diet Cranberry Juice Drink provides festive fruit flavor while cutting back on calories. Low Calorie Cranberry Sauce – Top-off a helping of turkey with this zesty, light twist on a holiday classic or pair it with a traditional jellied sauce cranberry log, which has delighted families since 1930. Sweet-n-Savory Green Beans – Bring boring green beans to life by adding Craisins® Dried Cranberries for an extra pop of color and flavor to make this side really stand out! 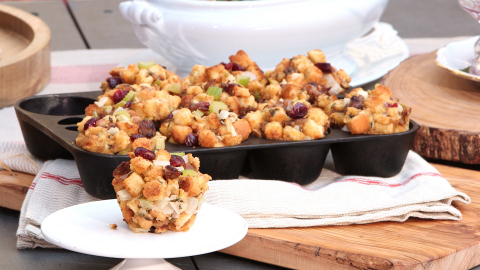 Individual Cranberry Stuffing Cups – Craisins® Dried Cranberries add a tasty twist and a little extra fruit to this holiday staple. And since they’re perfectly portioned cups, you’ll ensure that your guests save room for your exquisite desserts. Light Cranberry Mousse – Whip up a tasty after-dinner treat with a splash of Ocean Spray® Light50 Cranberry Juice Drink, a little cranberry sauce and some whipped topping. Looking for more inspiration or for some last minute help? Check out Ocean Spray’s Plan-it guide, the perfect party companion for the holiday host. Complete with pre-set menus, measurement guides and more, Plan-It is a one-stop shop for holiday entertaining. Disclaimer: it doesn’t help with in-laws. 400 million: Pounds of cranberries consumed by Americans each year. Twenty percent of that is during Thanksgiving week – 80 million pounds! 5,062,500: Gallons of jellied cranberry sauce Americans consume every holiday season. Ocean Spray produces one can of cranberry sauce per family per year on average – that’s over 70 million cans! 4,400: Number of pressed cranberries it takes to make one gallon of cranberry juice. 74%: Percentage of Americans who serve store-bought cranberry sauce at their Thanksgiving meals versus homemade sauce. For more fun facts, recipes, or last-minute entertaining tips, even on Thanksgiving Day, visit Ocean Spray’s Plan-It guide, Kitchen, or Consumer Helpline, or follow us on Facebook or Twitter. Fans can also tune into the 87th Annual Macy’s Thanksgiving Day Parade® at 9 a.m. ET, Thursday, Nov. 28 to see Ocean Spray’s Woodland Family Gathering float and comical character cranberry growers from TV. Cooking while you watch? Pin pictures of your favorite cranberry recipes and decor from Ocean Spray’s Pinterest page, or upload photos to Instagram, tagging @oceansprayinc. Ocean Spray is a vibrant agricultural cooperative owned by more than 700 cranberry and grapefruit growers in the United States, Canada, and Chile who have helped preserve the family farming way of life for generations. Formed in 1930, Ocean Spray is now the world’s leading producer of cranberry juices, juice drinks and dried cranberries, and is the best-selling brand in the bottled juice category. The cooperative’s cranberries are currently featured in more than 1,000 great-tasting, good-for-you products in over 50 countries worldwide. With more than 2,000 employees and nearly 20 cranberry receiving and processing facilities, Ocean Spray is committed to managing our business in a way that respects our communities, employees and the environment. In fiscal year 2012, Ocean Spray posted record-high gross sales of $2.2 billion and net proceeds of $338 million. This year, Ocean Spray is serving up five ways to turn tasty holiday staples like stuffing and cranberry sauce into a better-for-you banquet!